Frankenstein has become the leader of the prison known as The Sprawl, a 138-mile diameter walled-off area of ruined city where inmates are abandoned to fend for themselves. He has restarted the Death Race, broadcasting it on the darkweb. The Warden seeks to close the Death Race down but his SWAT teams are massacred by the convicts. A few weeks later, a new group of prisoners are delivered to The Sprawl and thrown into the midst of the harsh and brutal life there. One of the prisoners Connor Gibson defeats Frankenstein’s security and then walks in to challenge Frankenstein directly, saying he wants to compete in the Death Race. Gibson then takes on all the challenges he must pass through to win a place in the race where he seeks to defeat Frankenstein himself. Beyond Anarchy was the third of the sequels to Paul W.S. 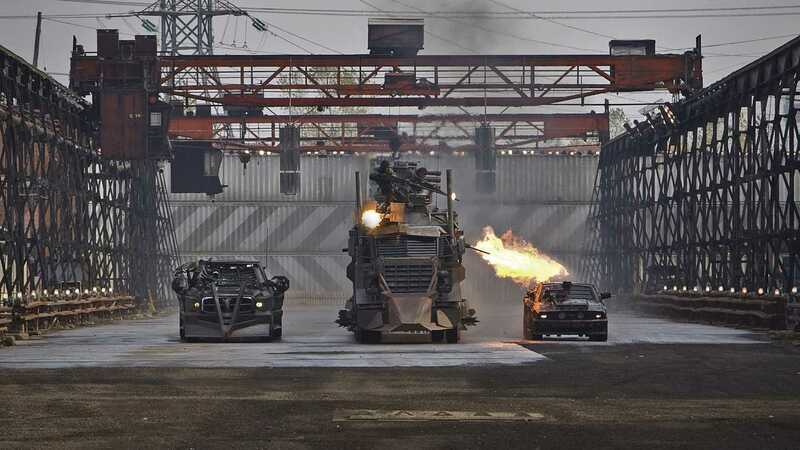 Anderson’s Death Race (2008), which in turn was a remake of the Roger Corman produced black comedy Death Race 2000 (1975). While his film was released theatrically, Anderson produced two dvd-released prequels with Death Race 2 (2010) and Death Race 3: Inferno (2012) under director Roel Reiné, followed by Death Race: Beyond Anarchy, which would appear to be set after the first film. In the meantime, Roger Corman oversaw yet another remake of the original unrelated to the Anderson-produced films with Death Race 2050 (2017). This sequel has been placed into the hands of Don Michael Paul who debuted as director of the Steven Seagal film Half Past Dead (2002) and has a made a handful of mostly action films that are mostly sequels to other people’s films. These include The Garden (2006), Lake Placid: The Final Chapter (2012), Company of Heroes (2013), Jarhead 2: Field of Fire (2014), Sniper: Legacy (2014), Tremors 5: Bloodlines (2015), Kindergarten Cop 2 (2016), Sniper: Ghost Shooter (2016), Tremors: A Cold Day in Hell (2018) and Scorpion King: Book of Souls (2018). Paul also wrote the Cyberpunk biker film Harley Davidson and the Marlboro Man (1991) and has another whole career as an actor. The scenario has changed since the previous Death Race films. In all of these Frankenstein was the hero forced to participate in a deadly vehicle race by a harsh penal system. Here the prison still exists and Frankenstein still participates in the Death Race but the warden is ineffectual and Frankenstein the dictatorial warlord running a brutal dog-eat-dog society within the walls of the prison. This takes the Death Race series more away from the vehicular gladiatorial combat of the original and closer to being a copy of Escape from New York (1981), especially with the idea of a walled-off city area where convicts have been abandoned and the hero of the show is a tough individualist loner who has been sent in on a mission by the prison authorities. I actually found Don Michael Paul’s take on Death Race the most interesting of the series so far. Paul immediately caught my attention with the opening sequence where a SWAT team arrives to try and stop the Death Race only to be surrounded in an abandoned indoor pool by convicts who bloodily massacre them, before one deranged inmate comes out with a chainsaw and carves up bodies, severing one officer’s head and triumphantly carrying it around. It is a strong and bloody opening for the film and holds you attention well. The world that Paul conjures is far too callous and casually bloodthirsty to seem credible as a social system. That said, I liked Paul’s concept of the future as a massive outdoor biker bar – one where everyone seems dressed in leathers, spikes and helmets, where all the girls are strippers, nobody seems to have bathed for a month and all that seems to matter is a series of suicidal gladiatorial battles staged for the masses. It’s all badass posturing but Paul pulls it off rather entertainingly. This does lead to the highly mixed messages the film seems to send out. We have the return of the ongoing character of Frankenstein who was the hero of the preceding films but is now depicted as the dictator of the world inside the prison, maintaining a system that would be regarded as ruthlessly sadistic in almost any other depiction. Frankenstein seems to sit between being hero and villain, although the film never seems to comment on the brutality of his world. 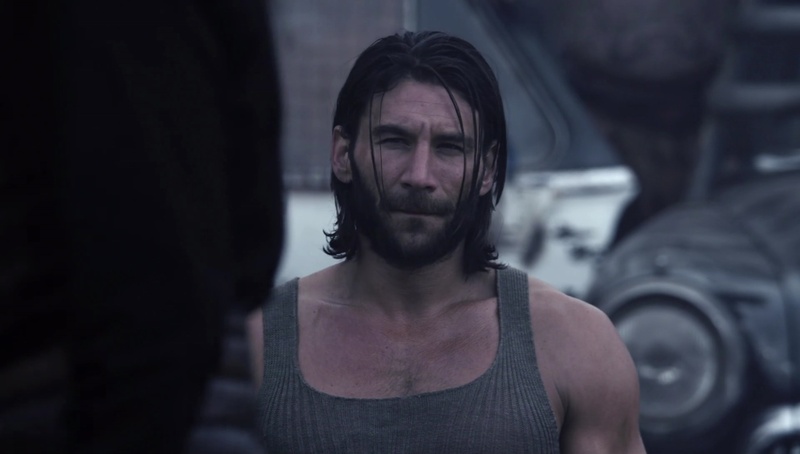 When Zach McGowan inherits the mask at the end, the question that lingers is whether he is going to create any better a world. Of course, McGowan is part of other weirdly skewed moral views of the film. He is positioned as a heroic identification figure but doing so also asks you to side with his attempts to kill the hero of the series and tacitly support the side of the Warden and Yeyland Corporation who are portrayed as the evil System in all the other films. The other oddity is that while all the other films have shown the prisoners as being forced to participate in the Death Races, this shows them having resurrected and running the Death Race themselves where it is now seen as a good thing – indeed, even the means whereby Frankenstein retains control of the prison – rather than a cruel punishment.